Most of us take our refrigerators and freezers for granted, but when you think about it, it’s really quite impressive how they maintain a cold environment 24/7 for years on end. Like all technology, though, a refrigerator can break, so it’s important that you understand the basic mechanics of the appliance and the warning signs of a breakdown. Whether you have growing concerns about a refrigerator that no longer consistently maintains the proper temperatures or you’re tired of excess frost and condensation, your refrigerator needs expert attention right away. 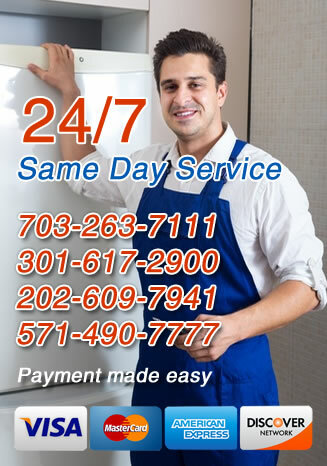 For fast and professional refrigerator compressor service in the greater Washington D.C. area, call All Time Services. There are variety of issues you may encounter when your compressor needs repair. The most obvious sign of a problem is if the compressor fails completely and your refrigerator and freezer stop cooling. If this happens, check the power source and make sure everything is plugged in properly. If so, call us immediately to check the appliance. While obvious problems like the compressor stopping or the appliance not cooling your food at all are obvious indicators of a problem, the vast majority of compressor problems can be pinpointed and resolved well before it gets this far. One of the most common early signs of a problem is noisiness or constant running of the compressor. When it gets noisy, there may be a mechanical reason – such as a loose bolt or screw – or it could simply be working harder to move the refrigerant through the machine. Another common problem is excess icing or freezing in the freezer or the refrigerator. A properly working compressor should maintain a steady temperature with minimal variation (regardless of how much food is in the refrigerator). If it doesn’t – meaning things freeze and thaw or the appliance simply never cycles off – you probably have a compressor problem. 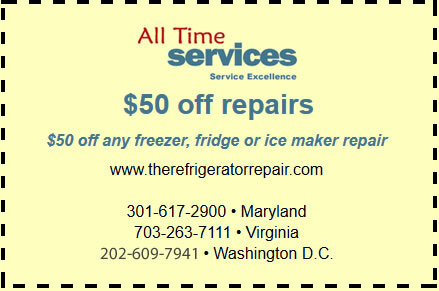 For professional refrigerator compressor repair in Arlington, VA, Gaithersburg, MD and the surrounding areas, look no further than All Time Services. We’ll get your refrigerator back in working condition fast. Call us today to schedule an appointment.